HiRISE 2009 image taken near the Martian North Pole. The dark streaks are landslides of basalt sand overlying dunes covered with white frozen carbon dioxide (dry ice). "That looks like a face!" What started out as a bit of whimsy based on a 1976 photo from a NASA Mars orbiter quickly morphed into a full-blooded new-age/extraterrestrial phenomenon. The "Face on Mars" became the centerpiece of theories about an ancient Martian civilization. Only with the release of 100-times-higher resolution photographs in 2006, which showed the face to be simply an eroded hill, did the hoax finally die away. All of which should be a giveaway that this week's headline comes under the "bait-and-switch" category. Much as I would love to report otherwise, there are no trees on Mars. Nary a one, not even in the accompanying photograph taken in 2009 by the same camera that put to rest the "face" malarkey, NASA's High Resolution Imaging Science Experiment (HiRISE) instrument on the Mars Reconnaissance Orbiter. Since 2006, this camera has added immeasurably to our knowledge of Mars. HiRISE is the most powerful camera ever launched to another planet. From its nominal orbit of about 500 miles above Mars, it captures the surface at a resolution of about 1 foot, three times finer than Google Maps' 1-meter resolution images of Earth. In addition, stereo pairs of HiRISE photos allow the Martian topography to be mapped at better than 1-foot elevation, which is hugely useful for planning landing sites for ground explorers. Incidentally, HiRISE showed off its capabilities last year when it captured Curiosity's landing. Curiosity — by far the most capable Mars rover to date — spent part of its "Seven Minutes of Terror" landing sequence dangling under a huge parachute. 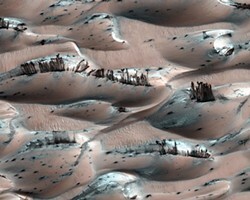 Check out HiRISE's extraordinary image. This HiRISE photograph, released in Jan. 2010, shows sand dunes coated with a thin layer of frozen carbon dioxide, or dry ice, near Mars' North Pole. The "trees" are actually seasonal 100-foot-long landslides composed of dark basaltic sand sliding down the dunes. Every spring, this pattern repeats as sublimating carbon dioxide ice (transitioning from solid to gas without an intermediate liquid phase) dislodges surrounding dust and sand particles. The dunes in the photo are part of a nearly complete ring of sand around Mars' north pole. In most places, the sand is covered by a thin layer of reddish Martian dust and patches of dry ice. Sadly, at this point, we have zero evidence of any type of biology on Mars, living or dead, past or present. As for the future, forests feature in all the "dream big" plans to eventually terraform Mars (i.e. transform it into an Earth-like planet). Trees, of course, naturally convert carbon dioxide into oxygen, offering a biological solution to the challenge of creating a breathable atmosphere on the planet. So for now, no trees on Mars. For the future ... oh yeah. I promise. Barry Evans (barryevans9@yahoo.com) will be taking along a sack of seeds when he's selected for a one-way mission to Mars.